Dr. Michelucci directs the Human Computation institute. He received a joint-PhD from Indiana University in Cognitive Science and Mathematical Psychology and has been a science advisor to federal research agencies since 2006. He has supported the emergence of Human Computation as a formal discipline through a Springer handbook, an open-access scholarly journal, speaking engagements and workshops, interagency initiatives in Social Computing, and Citizen Science working groups. 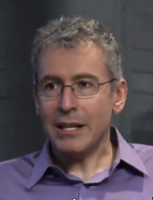 In 2014, he led the Human Computation Roadmap Summit, a CRA-funded 3-day workshop at the Wilson Center with input from the White House OSTP, toward a national initiative in Human Computation. As an Organismic Computing pioneer, he is interested in developing new methods for augmenting group efficacy, and developing related applications that will benefit humanity. He currently leads the EyesOnALZ project, which uses crowd-based methods to accelerate Alzheimer's research through an online game called Stall Catchers. Dr. Michelucci has been a visiting professor at Cornell University since 2016. 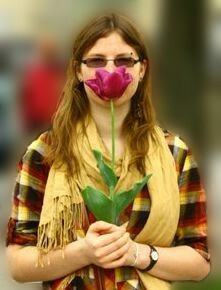 Ieva Vaišnoraitė-Navikienė is a software developer with a Bachelor's degree in Biophysics. She grew up in Lithuania where she studied at Vilnius university. Ieva has been interested in how eye movements can reflect unconscious human emotions. She developed an online system for modeling human attention that measures people’s engagement while watching videos by tracking their eye movements, electrical brain activity and galvanic skin responses. Ieva is passionate about applying modern technologies to cognitive science and exploring how the two areas can be mutually supportive. She is fascinated to participate in EyesOnAlz because it connects many researchers from different fields and brings together brilliant ideas. She is currently developing the online Stall Catchers game so everyone can join the project. Egle M. Ramanauskaite is a science writer, educator and researcher, passionate about Citizen Science and the positive impact it can have on society. Egle earned her first Master’s degree in Molecular and Cellular Biology at University of Bath (UK) in 2011, and is now pursuing a Master’s in Education Science at Vilnius University (Lithuania). Current research interests include learning and creativity in Communities of Practice, such as ones formed around crowdsourcing initiatives. Before joining Human Computation Institute, Ms. Ramanauskaite was an intern at Citizen Cyberlab. She writes science and technology news at TechnologyOrg, and organizes and contributes to various independent Science Education projects. 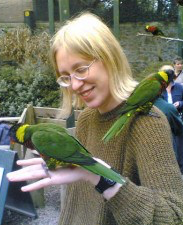 Alice Sheppard began running the first discussion forum for Galaxy Zoo, the citizen science project with 300,000 members worldwide which contributed to many academic papers in which "ordinary" citizens were listed as authors or acknowledged for their contributions, and which led to the vastly successful Zooniverse. Under Alice's leadership, the forum became 'the politest place on the Internet', where astronomical questions were answered, people taught each other how to use databases and astronomical spectra, and various new astronomical objects were discovered. She is keen to create similar supportive, diverse communities in other projects, in which everyone's contribution is important, and gives regular talks about citizen science and astronomy. She writes the Citizen Science column for the Society for Popular Astronomy magazine.